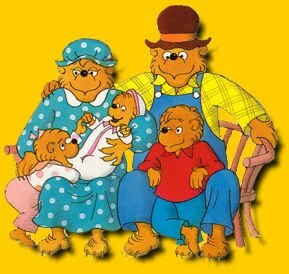 Each night, Husband comes home from work, changes out of his suit, plays “Monster” on the bed with the boys and then the three of them settle in (on Husband’s lap) for an episode (or three, depending on the Yankees game) of pre-recorded Berenstain Bears. The singing of “Somewhere Deep In Bear Country” and the sound of my pouring a glass of chardonnay (ahhh…) are inextricably linked. Anyway, an actual conversation tonight. BB: Do you know who my favorite Bear is? Now, the true answer here is “yes”. It’s Sister Bear. But, Husband isn’t much of a fan of that whole idea so the response goes as follows. Husband: Hmmm. Let me think. Is it Papa Bear? BB: (Frustrated) DAD!!!! It’s Sister Bear! I just love my husband.